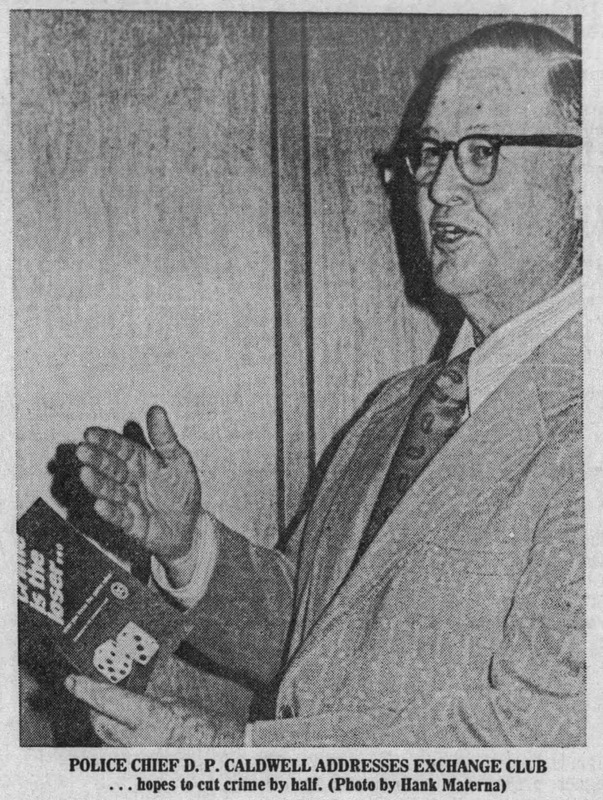 Whether through rumors, scuttlebutt, or maybe the indiscreet whispers of one of the participants, by late summer 1963, Pensacola Police Chief D.P. Caldwell felt he knew who committed the robbery of the Bank of Jay. Getting enough evidence to prove it however, was a different story. On the 25th of October, Chief Caldwell suspended, and asked for dismissal of Officers Luther Ingram, and Louis J. (Jimmy) Dees. The two officers had been partners for years, and Ingram once lived next door to Dees, in a house owned by Dees. The charges levied against Dees were, 1-holding ownership of a bar. 2- failure to reside within city limits, and 3- failure to be qualified as a registered voter. Ingram was charged with Insubordination, and failing to obey a lawful order. On the 25th of October, Jay bank officials, Price Malone, and Jesse Golden traveled to the office of Police Chief Caldwell to view two line-ups. One line-up had Officer Ingram, and three other officers. Golden told the Chief that Ingram looked very much like the man in the hold-up, but couldn’t positively identify him. Malone said he would be willing to testify that Ingram was the man who held a gun on him during the robbery. An hour after his line-up, Ingram was called back to the Chief’s office and told to put on a raincoat, and dark glasses of the type that the bank robbers wore. Ingram requested to confer with his lawyers, Forsythe Caro, and Joe Harwell. He then refused to don the items requested and was suspended from the force. Officials would not say who was in the other line-up, but it is interesting to note that Ingram’s partner, Dees was suspended the same day. There was a hearing on November 26th, where Ingram was found guilty of insubordination by a 2-1 vote of the City Service Board. At his hearing Ingram testified that he refused to wear the items in the line-up because he knew he was a suspect in the robbery, and he knew that the two bank officials from Jay were there to view him. He also claimed to have heard from a relative in Jay that the bank officials had mistakenly identified another suspect in Jacksonville. Ex-Santa Rosa County Sheriff Henry Clay Mitchell spoke on Ingram’s behalf by stating that he did not believe a person should be ordered to “don the garb” of a robber and appear before witnesses. The decision by the City Service Board was eventually overturned and Ingram returned to the Pensacola Police Department. He eventually resigned in November of 1972. He had been suspended many times in his 16-year career and Caldwell tried more than once to get him dismissed from the force. It has been told to me by an ex-officer of the Pensacola Police Dept., that for the rest of his time on the force, Ingram would never don a raincoat. Not even while investigating auto accidents in the rain. Ingram passed away at the age of 51 on April 8, 1983. Louis J. (Jimmy) Dees resigned from the force that day of the line-up in November 1963. He was the owner of the Liberty Bar, located at Zaragoza, and Baylen. In 1970 he bought the Castle Lounge at 500 East Gregory St. He sold it and moved to the Atlanta area in 1978, but later returned to buy Al’s Bar and Package Store on Gulf Beach Highway. He passed away in December 2005. The Robbery of the Bank of Jay was never officially solved. No one was prosecuted for it, and no one was formally accused of committing it. The Pensacola Police Chief, D.P. Caldwell definitely was convinced of the officer’s involvement, and tried to use any reason to get them off the force. A week after the Robbery in Jay, Officer Ingram was awarded “Policeman-of-the-Month” by the Greater Pensacola Chamber of Commerce. During the time Jimmy Dees owned the Castle Lounge, an unknown person placed a sign out front that read, “Financed by the Bank of Jay”. Officers Ingram, and Dees were not prosecuted for the robbery, and Ingram returned to the force for another 9 years before resigning. On Wednesday, the 23rd of January, the small town of Jay, Florida was in the grip of a severe cold spell. The temperature had dipped down to 5 degrees. Around noon, two young, well-dressed men wearing grey plastic raincoats, dark trousers, and shined shoes walked into the Bank of Jay, and walked up to the desk of Jesse L. Golden, the Executive Vice President, and head cashier. One man was later described as about 30 years of age, 190 pounds, with a slender build and light brown hair. The other about 27, 5 feet 8 inches tall, medium build with dark wavy hair and a broad forehead. Mr. Golden looked at the two men as they drew pistols, and ordered everyone to lie on the floor in a back room. One of the gunmen entered Malone’s office and told him and the Scott family to get down on the floor. Mr. Scott told his daughter, “Honey, don’t open your mouth.” The robber said, “Fella, you open your mouth again, I’ll blow your head off.” The people in the other room were told, “We will shoot if you raise your head.” The taller of the two men paced back and forth between the two rooms while his partner emptied the teller drawers. 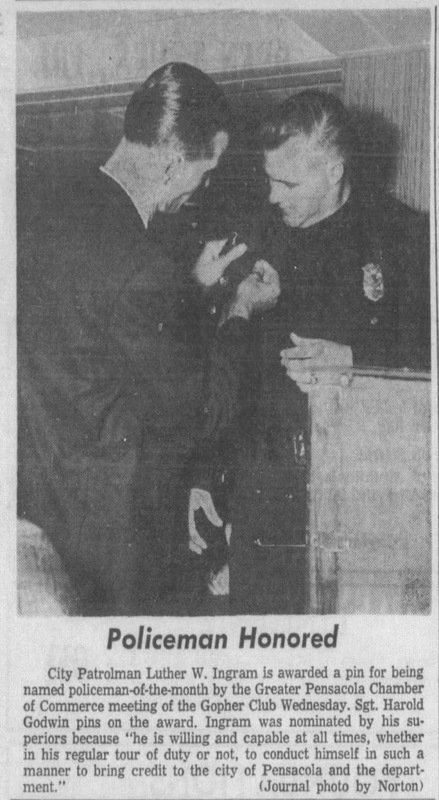 After he had the money from the teller drawers, the same man entered the room where the bank employees and examiners were on the floor, and place his pistol to the back of John W. Ellis’ head and ordered him to open the safe. Ellis was a chief bank examiner with the Federal Deposit Insurance Corporation. Ellis refused saying he did not know the combination. When the man threatened to shoot Ellis, Jesse Golden volunteered to open the safe. While this was going on, four other bank examiners who had been out to lunch walked into the bank, and were immediately ordered to the floor. Back in the lobby, the gunmen ordered Golden to unplug the phones, but Golden told them the phones did not have plugs. 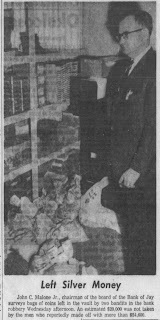 After filling pillow cases with money from the vault, and apparently deciding two bags containing $700 in nickels, and half dollars were too heavy to manage, the robbers left. They told everyone to remain on the floor for five minutes, but about a minute later, Mr. Malone called the Sheriff’s office, and the FBI reporting the robbery. 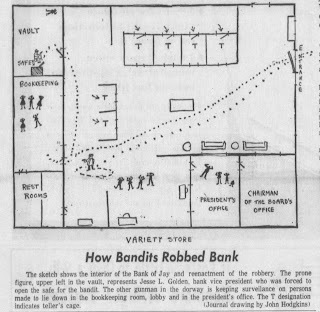 The robbers had overlooked about $20,000 in Silver bills, and securities in the vault, and left the heavy bags of coins about half way from the vault to the bank door. 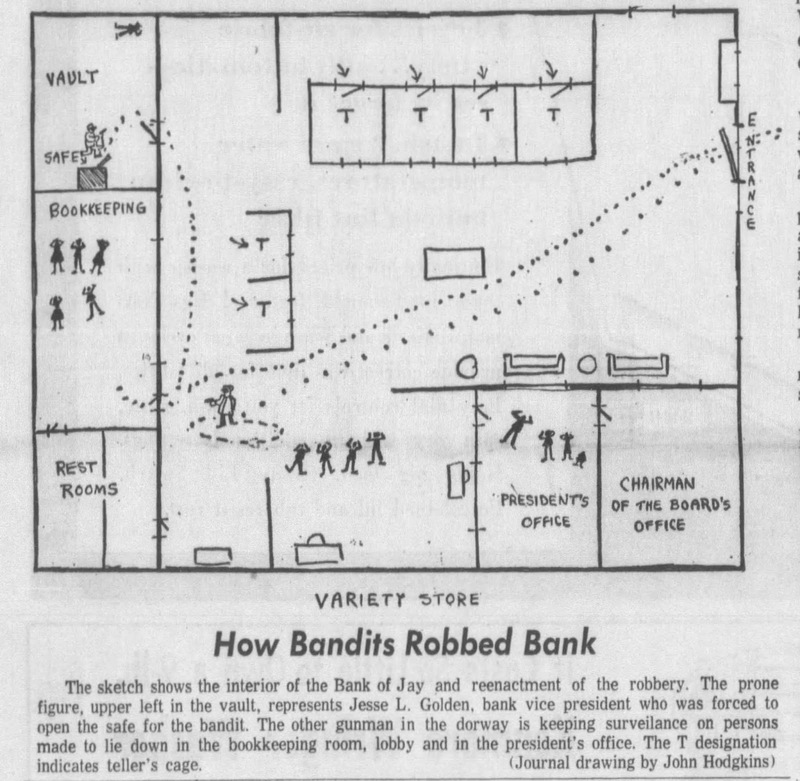 This was the first time the bank had been robbed since it was organized in July 1951. There was no bank guard there. Malone later estimated that the whole robbery took between 10 and 15 minutes. It was determined that the robbers had gotten away with $54,611. They drove west on Hwy 4 at a high rate of speed to Century, and beat the road blocks that were quickly installed. The next day it was discovered that they had switched cars in the parking lot of a Century elementary school. They left a 1961 blue-green Falcon Futura, and according to witnesses, drove away in a 1959 white or cream-colored Chevrolet. The Futura had been stolen from the Auto Center on West Garden St. in Pensacola on January 13, and probably stashed somewhere until the robbery. On February 10th, a “ragpicker”, who has remained anonymous, was scavenging in a wooded area between Olive and Creighton roads east of Ninth Avenue for any metal he could sell and saw an area that looked as if it had been freshly dug up, and filled back in. Curious he dug down about a foot and found an aluminum Coleman cooler. Inside the cooler were two insulated picnic bags with $40,220 of the loot stolen from the Jay robbery. After consulting with his brother, he contacted the authorities, who staked out the site for two weeks, hoping the robbers would return. Then the FBI went public asking the public for information. Many tips came in, but ultimately the authorities did not discover who committed the robbery, or buried the money. They did discover that the cooler was purchased at Hess Marine on New Warrington Rd., on January 24. Sales people remembered the customer quibbling about the price and receiving a discount. The insulated picnic bags were traced to Harvell’s Pharmacy on North Palafox, and Brent lane. The man who found the buried money did not receive any reward for turning it in. The bank’s holding company, the Hoover Insurance Company of New York, refused, saying they had no policy of giving rewards. There was a robbery in Marianna, Florida with a lot of the same characteristics, but it was determined to not be linked to the Jay robbery. The same month also had a robbery nearby at Ellyson Field, also found not to be linked, even though there was some suspicion that the Jay robbers might have been sailors from Ellyson because of the shined cordovan shoes, and the confident manner of the two men, and the proximity of the Naval installation to the burial site. It was also thought that a Pensacola police officer could have been involved, but ultimately, the case was never solved. 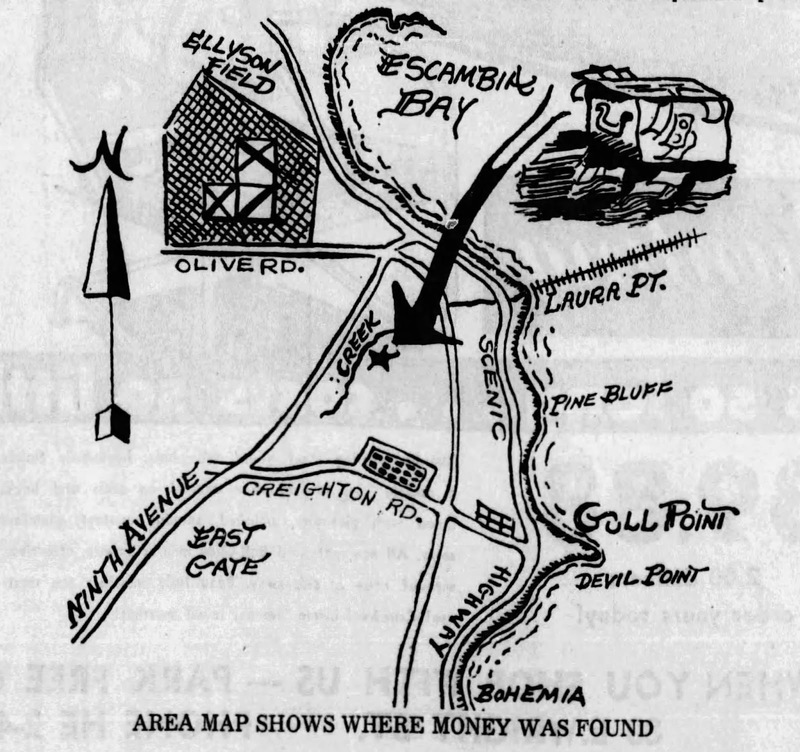 The pictures are all from the Pensacola News Journal, January, and February 1963. In March of 1940, when Ray Wilson was twelve years old, his father Lester was assassinated in the living room of his home while listening to a radio broadcast. Ray was asleep in the next room at the time of the killing. As he grew older, he realized that the local authorities were not that interested in finding the killers, so he made a promise that one day he would be elected Sheriff, and bring justice to his father. That is exactly what he did. 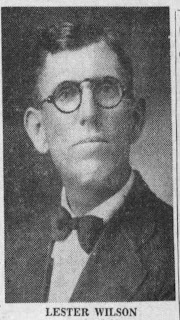 Lester Wilson was the Chief of Police in Crestview, Florida in the 1930’s. He unsuccessfully ran for Sheriff in 1932, and again in 1936. On March 1, 1939 he shot and killed Murray McArthur, and wounded Charlie Powell outside a Crestview tavern. He claimed it was self-defense and the result of an old grudge when he was Chief of Police. A jury acquitted Wilson of Manslaughter. Wilson had let it be known that he was going to once again run for Sheriff in the upcoming primary. The incumbent Sheriff John Steele was not seeking reelection. It looked like his chances were good. He would be running against H. Isle Enzor. Enzor was the brother of Dr. Olin Enzor, who with another brother Dr. Jut Enzor had founded the Enzor Brothers Hospital in Crestview, and were well respected in the area. Lester Wilson owned a taxi and his cab stand was at the Sun Ray Café in Crestview. His son Woodrow shared the cab driving duties with him. At 8 pm Woodrow drove Lester home, dropping off a fare, Mrs. Vernie Davis Locke, at her house, on the way. After dropping Lester off at his home on Long Street, he took the cab back to the Sun Ray Café. Lester entered his house and warmed himself by the fire for a couple of minutes. He then sat down in a chair very close to the front door and near the radio to listen to a news commentary. All the doors and windows were shut because it was only about 36 degrees that day. Outside a man with a shotgun approached the house and peered in the window to see where the occupants were. A moment later he fired one blast through a small glass window in the front door hitting Lester Wilson in the head and killing him instantly. H. Isle Enzor was elected Sheriff, and the case remained unsolved for 18 years. Sheriff H. Isle Enzor served as Sheriff from 1941, until Aug 3, 1950 when he was removed from office by Gov. Fuller Warren for not enforcing laws against gambling. Fox Wilson, brother of Lester Wilson, was removed from his role as Constable for the same cause. The Gov. appointed Enzor’s son-in-law, Ferrin C. Campbell to take his place. Campbell was a Democratic candidate for the State House of Representatives and resigned in November. Gov. Fuller then appointed James A. McArthur to the office of Sheriff. Former Sheriff Enzor won his seat back in the following election, and served until 1956. Ray Wilson was only 28 years old when he defeated Enzor in the primary. 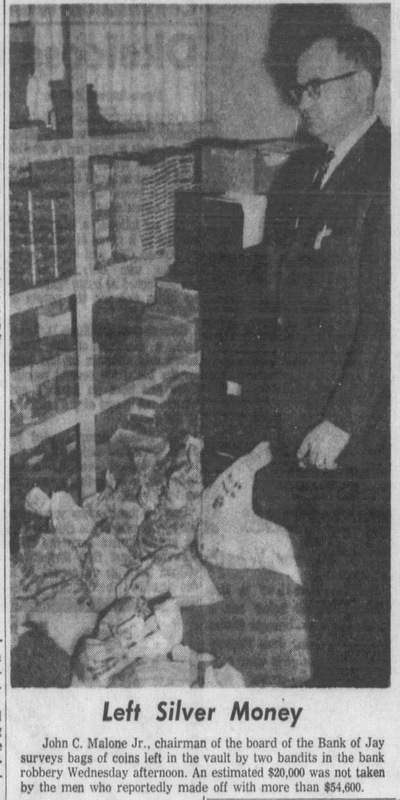 In June of 1956, Sheriff Enzor had a fatal heart attack at his home, and the Governor appointed Ray Wilson to go ahead and take the role as Okaloosa County Sheriff. At 28 he was the youngest Sheriff in the state of Florida. 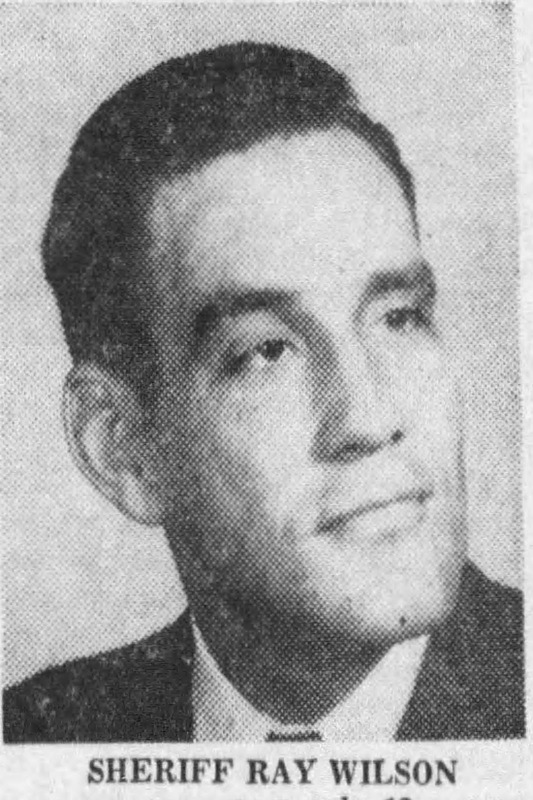 Ray Wilson graduated from High School in Crestview in 1946. He joined the Army and served in Korea in the 7th Infantry. When he returned to Crestview, he worked in a dry-cleaning business until he bought his own dry-cleaning operation. When he decided to run for Sheriff, he sold his business. Driven by the need to bring his father’s killers to justice, he almost immediately reopened the investigation. 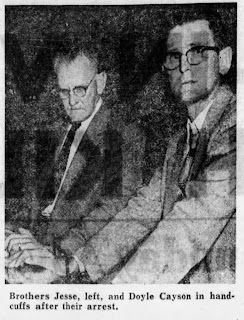 In 1958, brothers Jesse, and Doyle Cayson, and William Dorace Brown were arrested for the 1940 murder of Lester Wilson. There were many witnesses at the trial of the three men. Some had been called as witnesses during a Grand Jury hearing in 1952, but they were not as forthcoming at that time. More than one claimed they were afraid to testify truthfully at that time. The courtroom was standing room only during the week-long trial in November of 1958. There were about 235 people in the spectator seating during the whole trial. The jury consisted of 11 men, and one woman, Mrs. Raymond Byrne. n Jesse Cayson fired the shotgun and killed Lester Wilson. n The other two defendants aided and abetted in the killing. One of the most important witnesses for the State was Mattie Lee Taylor Boeck, 45, of San Antonio, TX. She was known as Mrs. Lucas during her stay in Crestview. She arrived in town from Andalusia, Alabama in January 1940 to work in a shirt factory. She and a girlfriend lived in a house not far from the Sun Ray Café where Lester Wilson had his cab stand. She had many dates with the Cayson brothers during her time there. She said she did not know Brown, but had seen him around town. She heard many discussions about the upcoming election for Sheriff. Mrs. Boeck testified that she went to the Sun Ray Café where Jesse Cayson, and Dorace Brown were seated at a table. While she was sitting with them, they received a phone call from someone wanting to know who was driving the Wilson cab. The caller was informed that the driver was Lester’s son, Woodrow. Prior to the call Cayson, and Brown were discussing how to get Wilson out on a fake call and mentioning, “do the thing, or do the job.” She said she thought it was a joke. Shortly after the call Doyle Cayson came in to the café and said, “Plans have changed, come on, we’re going to do the job tonight at the house.” She walked out to Brown’s parked car and saw two shotguns in it. She got in the car, but after some discussion, the others decided she would wait at the café. As she returned to the café, she saw the Wilson cab pull away with the defendants following about a block behind with their headlights off. A little later Woodrow Wilson came back in the café and told her he was going out on a call, in case anyone was looking for him. Then he drove away. Shortly later, Fox Wilson, brother of Lester came in the café and told her Woodrow’s father had just been shot. She claimed she was the one who told Woodrow about his father’s death. Mrs. Boeck said she then went home for a few minutes, then went to the post office. When she left the post office, Brown drove up and forced her into the car. They drove away and shortly picked up Doyle Cayson. Then they drove down the highway beyond the Shoal River bridge and stopped. They stayed there for a few minutes, then drove a little farther down the road where Doyle got out. She and Brown drove to another spot nearby where they sat and talked. As they were talking, someone opened the car door and pulled her out. She said she was beaten with some type of club and told to forget what happened that night, or “this isn’t half what you’ll get.” Brown remained in the car during the beating. When she got back in the car, he told her he was sorry but there was nothing he could do. “My advice to you is to forget what happened tonight.” Brown took her back to town, where she returned home and went to bed. This was between 10 and 11 pm. About midnight, Doyle Cayson came to her house and took her, “down near railroad tracks,” where they remained until 3:30 or 4 am. She said Doyle had been drinking. Mrs. Lester Wilson testified that she and her father were in the room when the fatal shot was fired through the small window in the door. She said she only knew the defendants by sight, but she did not see who shot her husband. Woodrow Wilson testified that he had been helping his father with the taxi business. He said he took his father home around 8 pm. A customer, Vernie Davis Locke, was in the car for most of the trip. They dropped her at her home on the same street where Wilson lived. He explained that his father, Jesse Cayson, and a man named Adams were the only taxi operators in Crestview at the time. Mrs. Marie Slaughter Coker had worked as the chief operator for Southern Bell Telephone company in Crestview on the night of the murder. She testified that she heard the voice of Doyle Cayson on the telephone talking to someone in the Sun Ray café asking who was driving the Wilson cab. Her testimony was later refuted by Constable Adams, ex Sheriff Steele, and her husband at the time who claimed she never mentioned the conversation to him. Another very important witness for the state was Curtis Davis, 35, a lumber company truck driver who was a 16-year-old neighbor of Wilson when the slaying occurred. He heard the shot that killed Wilson as he approached a service station while walking along State Road 85 toward his house. He said he was about 100 feet from the station and the intersection with Long Street. Wilson, and Davis both lived on Long. Not more than two minutes after the shot, he saw a 1938 Ford speed out of Long and turn south on the highway. At intervals he then saw a 1937 Ford, and then a 1934 Ford with red wheels. The ‘37 Ford turned south at a high rate of speed and the ’34 Ford couldn’t make the turn and continued straight across the highway and disappeared down the street. Davis identified the first car as belonging to Constable Joe Adams, saying he recognized the spotlight and the radio antenna. The second car had more than one occupant, but he could not identify them. The third car, he said, belonged to Doyle Cayson. Mrs. Vernie Davis Locke was Curtis’s sister, and had been the passenger that was dropped off by the Wilsons right before the murder. She testified that after being dropped off, she saw two cars come down Long Street at intervals, turn around in front of her house, two houses away from the Wilson residence. Very soon afterwards she heard the sound of the shot. Her and her father went towards the Wilson house and they noticed two cars parked close together across the street with the lights off, and heard a car door slam. The headlights came on as they approached. She said at least an hour later, she saw Doyle Cayson at the Wilson house, and recalled at least three times he brought up the subject of his being away on a fishing trip when the shooting occurred. “Each time he advised me to see the fishing tackle and equipment in his car. I told him I would take his word for it.” Mrs. Locke contradicted the testimony of Mrs. Boeck when she said that she did not see the Caysons, or Brown at the Sun Ray café before the Wilsons gave her a ride home. There were a couple other witnesses that claimed that a drunken Doyle Cayson had bragged about being involved in the killing. Doyle Cayson emphatically denied the State’s witness testimony. He flatly denied having anything to do with the killing of Lester Wilson. He claimed he left Crestview late in the afternoon of March 15 with Burris Brown, (no relation to defendant Dorace Brown), and fishing in the Ti-Ti and Silver Creeks area about 15 miles southeast of town during the time of the killing. Doyle claimed he had never seen Dorace Brown until he was locked up with him in the Panama City Jail on a murder charge. Clarence and Roy Alford, and Charley King, all of Crestview, told of seeing Doyle fishing and backing up his story. Doyle also said he did not get back to town until after 9 pm to get his headlights fixed. Arlie Royals, Sr. was a mechanic who claimed he fixed the headlights on Doyle’s car in the early part of that night, and he told the two of Wilson’s death. He also denied in its entirety all of Mrs. Boeck’s testimony. The court then heard a deposition from Mrs. Lillie Lindsey on behalf of defendant Dorace Brown. She said Brown and his wife were at her home visiting with her ill husband on the night of the killing. Later the defense produced other witnesses to back up Mrs. Lindsey’s story. The Jury returned a verdict of Guilty for the Cayson brothers, with a recommendation for mercy, and they acquitted Dorace Brown. On December 1, 1958, the Caysons were sentenced to life in prison at Avon Park Correctional Facility. Before sentencing Attorney, Thomas Beasley introduced affidavits from five relatives of Hiram Lester Walker of Baker purporting to show that Walker had made a deathbed confession to the Wilson murder. Walker had passed away at the Enzor Brothers Hospital in Crestview on November 24, 1957. Over the next few years there were many appeals on the brother’s behalf. Attorney Thomas Beasley claimed that they were innocent and he knew who the real killer was, but could not say because of attorney-client privilege as he had represented him. The Caysons were given polygraphs and supposedly passed them, but all appeals were denied. The Caysons were both paroled in 1966. Jesse passed away in July 1968, and Doyle in August 1968. I don’t think it is conclusive that the Caysons were guilty of this murder. I think the testimony of Marjorie King should be discounted entirely. Her own husband refutes her account and said she used narcotics. Jesse’s sister later said she was the one who convinced Jesse to go to the hospital, and he was on his way within the hour. She claimed Mrs. King was no where around. I believe Mrs. Boeck was mostly truthful, although her timeline might have been off. She claimed Doyle came to her house at midnight, and stayed with her until almost 4 in the morning. There were several witnesses that reported that Doyle was at the Wilson house most of the night. He even helped clean the crime scene. Enough people said that she definitely had relationships with the brothers, and the owner of the Sun Ray café said she and the Caysons were in his café that night. 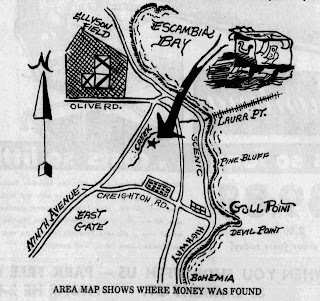 One thing for sure, this case divided the people of Crestview into two separate camps for years after the trial. Family members quit speaking to each other, and long-time friends became estranged over their beliefs in the guilt or innocence of the Caysons. This case made national news. There was an article in Readers Digest and an article I found in a Honolulu newspaper. I believe also there was a documentary that Ray Wilson took part in after the trial. As always, if anyone reading this has any information that may have been passed down to them, I would be most happy to hear, or see it. On the morning of July 12, 1957, at the Roberts Cemetery, also known as the Gull Point cemetery, located off Creighton road, the caretaker was making his rounds when he discovered an open grave. The 3-inch-thick, 1000-pound slab had been removed, and the casket opened. The remains of Ruby Lee Robinson were lying exposed. She was a 22-year-old who had died in childbirth the previous November. The caretaker immediately contacted the police who quickly arrived at the scene. They first thought robbery to be a motive, but after learning from her husband that she was not buried with any valuables it was ruled out. One neighbor reported hearing a loud howl about 2 am, but did not see anything that could have caused it. 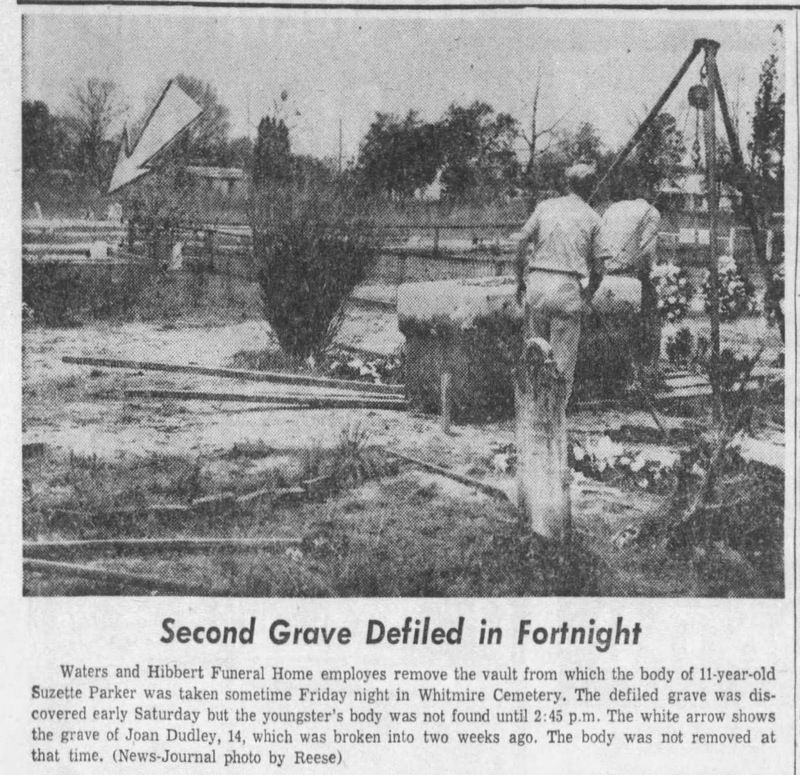 Three days later, on the 15th, a man visiting his wife’s grave at the Whitmire cemetery discovered his late wife’s grave open and her body exposed with her pajamas pushed down. She had been buried the month before. The authorities never released the identities of the man, or his wife. 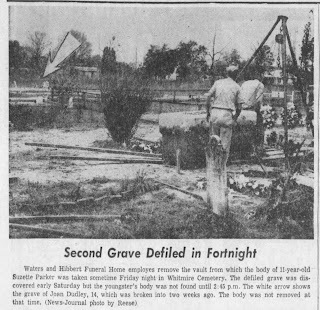 Seven months later on the 22nd of February, 1958, Mrs. Thelma Wendt of Ferry Pass, was making a visit to the Whitmire cemetery when she discovered the disturbed grave of 14-year-old Joan Danley. Miss Danley had been killed on Nine Mile road when she was struck by a car the previous October. A 1200-pound slab had been removed, and the casket opened. Plaster casts were made of numerous footprints in the immediate area. Sheriff Emmett Shelby offered a $500 reward for information. Later the reward grew to $1500. The city council contributed $500. 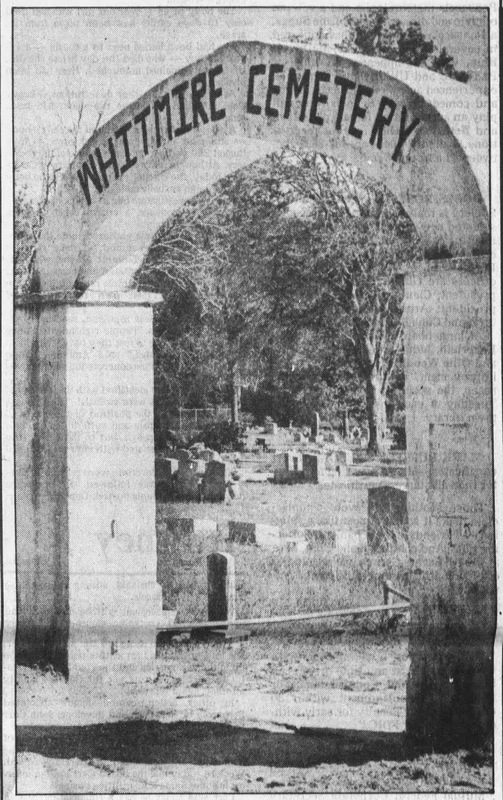 At 8:30 am on the 8th of March, Mrs. Thom Holmes was at the Whitmire Cemetery to visit her husband’s grave. She discovered the open and empty grave of eleven-year-old Suzette Parker. Police arrived and began to make plans for a search. Helicopters from Ellyson Field, and bloodhounds from the state prison were going to be utilized in the search. About 2:30 pm, mounted County Patrolman Roy Sherer on a horse named Trigger, found the remains of the missing girl about 250 yards from the entry to the cemetery. She was lying on her back still in the pink dress she had been buried in. Suzette had passed away after a long illness on the 28th of February, and was buried next to her first cousin Daniel Paul Parker who had died the previous day in Groves Texas. There had been a double funeral on March 2nd. His grave was undisturbed. The locals in the area started patrolling the streets in the area, and the mood was ripe for vigilante justice if the ghoul was ever captured. No more incidents occurred in the Whitmire, or Roberts Cemeteries. The person, or persons were never identified. 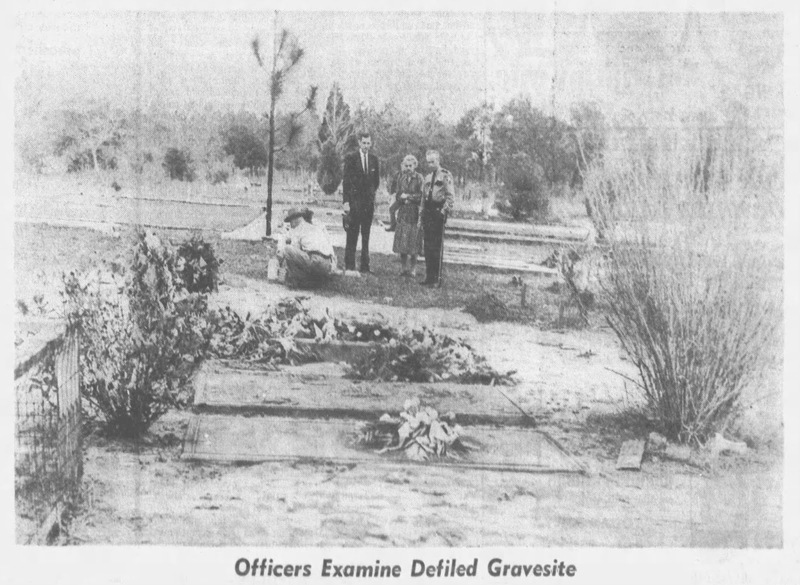 Even if they had been, grave desecration was a misdemeanor and would not have resulted in much, if any, jail time. Maybe they were arrested for something else and went to prison. Maybe the increased patrols led to him moving somewhere else. The events seemed to be escalating and I can’t imagine that he, or they just decided to stop. I guess we will never know. I just finished a very well written book by Bill James titled: The Man from The Train, The Solving of a Century-Old Serial Killer Mystery. It is the story of a long series of Axe murders across the country that occurred from 1898 through 1912. The Ackerman murders near Allentown, fit right into this narrative. Even setting the fire after the killing was part of the killer’s technique. He quite possible killed over 100 people in this manner and rarely left any survivor. The Villisca Iowa killing of the Moore family is also part of this story. He makes a rather compelling case, due to the similarities among these many, many murders. The fires, proximity to rail road tracks, covering the face of some of the victims, and many more examples. The suspect was a German immigrant named Paul Mueller who killed his first victim in Brookfield, Mass. Many of his murders occurred in rural areas close to logging which is probably how he supported himself. He never robbed his victims, usually leaving valuables in plain sight. He makes a compelling case. I definitely recommend it. It was Sunday morning, June 24, 1934. Luther D. Padgett, known as L.D., and his wife Daisy were making the three mile walk from their once shared home to the residence of her parents. L.D. was walking slightly behind Daisy, and simmering with sadness, and anger that she had refused his efforts to reconcile and move back in with him. They had been separated since Christmas. He later told Sheriff Joe Allen, “I loved her and I couldn’t stand to see her go.” Using a turpentine hack, he hit and slashed her in the back, and as she fell struck her in the neck, chest, and stomach. As he dragged her off the road and into the woods, she begged him to let her see their two small children once more before she died. He left her moaning and dying in the woods. He disposed of a bundle she had been carrying in a nearby creek, and tossed the murder weapon into some bushes. Padgett returned home and tried to sleep, but it was too warm. He walked to a nearby friend’s house, then actually visited some of Daisy’s family, before returning home to be met by Sheriff Joe Allen and placed under arrest. Padgett almost immediately gave Allen a confession. Sheriff Allen had been notified earlier of the discovery of a body by a cattleman named Ed Fuqua. Mr. Fuqua had been walking down the road looking for some of his cattle and noticed blood on the side of the road and drag marks going into the woods. He found Daisy’s body and reported it to the Sheriff. The events described occurred very near the Alabama, Florida state line near McLellan. Daisy was the daughter of Lawrence Clayton Locklin, and Hattie Mae Fleming Locklin. Her younger brother was Lawrence Hankins Locklin, also known as Hank Locklin, the very popular country music artist. She was employed at a restaurant in Brewton, Alabama. Her and L.D. Padgett had married in Escambia County, Alabama on March 30, 1929. At the time of her death they had a four-year-old son and a baby daughter who were subsequently raised by her parents. Daisy was buried at the McClellan cemetery. L.D. Padgett was the son of Robert Lee Padgett, and Mary Blanche Smith Padgett. Many of the family members from both the Padgetts, and the Locklins are buried at the McClellan cemetery. 26 Sep 1934. L.D. Padgett was indicted by the grand jury on a charge of first-degree murder. The court appointed attorney’s J.T. Wiggins, and T. Franklin West of Milton to represent Padgett. The prosecutor was E. Dixie Beggs, and Judge L.L. Fabisinski would hear the case. 29 Sep 1934. L.D. was convicted of first-degree murder without recommendation of mercy by the circuit court jury and sentenced to death in the electric chair at the state prison in Raiford by Judge L.L. Fabisinski. The trial lasted most of one day and the jury deliberated for 30 minutes before returning the verdict. Padgett had made an oral confession to Sheriff Allen, and later a full written confession after his arrest. 8 Oct 1934. Padgett was transferred to the county jail in Pensacola to await transfer to Raiford. Sheriff Allen stated that he had received orders from Governor Dave Sholtz to bring the prisoner to the Escambia County jail. He said he did not know the reason for the transfer. 27 Sep 1935. Padgett appealed his death sentence on the grounds that the crime was not premeditated, but the Florida Supreme court reaffirmed his death sentence. 2 July 1936. A hearing was scheduled to ask the State Pardon Board to commute his sentence to life. Also scheduled was a hearing for a convicted wife murderer from Pensacola named Lee Clark. 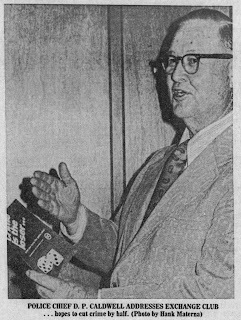 T. Franklin West was there to represent Padgett. Judge Fabisinski, who sentenced Padgett to death, said he did not believe the crime was cold-blooded in nature, and that a commutation should be granted. The hearing was then delayed. 5 Aug 1936. The State Parole Board denied the application to commute the Padgett, and Clark sentences to life, and Governor Sholtz signed the death warrants for both men. The date of execution was set for the week of August 17. State law required a condemned man to serve five days in the death house at the state prison before the execution. The prison superintendent fixes the day and time for all executions. 17 Aug 1936. The date of the scheduled execution. Padgett was to be put to death at 11 a.m. with Clark following shortly after. Sheriff Allen from Santa Rosa county, and Sheriff Gandy of Escambia county made the trip to Raiford. State law, at the time, required the Sheriff of the county in which the crime was committed, to pull the switch himself, or appoint a deputy. Sheriff Allen had executed a convicted murderer named Ed Bradley a few weeks before. The two condemned men had their last meals, had talked to their spiritual advisers, and had their heads shaved. Thirteen minutes before Padgett was to be put to death, Governor Sholtz called from Roanoke Virginia, to grant Padgett a 30 day stay of execution. He wanted to have another clemency hearing before the State Parole board. A delegation of citizens from Milton wanted to appear before the board. The prison superintendent on his own authority delayed Clark’s execution also to give his attorney R. L. Reece of Pensacola time to seek a stay of execution for him. Since Clark was a black man, I wonder if the authorities did not want it to seem as if Padgett was getting favorable treatment. 14 Sep 1936. “Please spare the life of my son,” was the plea from Padgett’s mother. His application for clemency was supported by a group of citizens from Milton, but there were also letters of protest from the prosecuting officials and other citizens. Clemency was once again denied by the board. 19 Oct 1936. 4 MEN DIE IN RAIFORD CHAIR WITHIN HOUR, State Carries Out First Quadruple Execution. This was the headline in the Tampa Tribune on 20 Oct 1936. The first two men were executed for the slaying of a Miami druggist during a holdup in 1932. Both Lee Clark, and Luther D. Padgett were buried in the Prison cemetery. On a cool, overcast afternoon in late December 1913, Hyman “Boy” Cooley heard that Leon Rivenbark was at the Flower’s Stockade home of Turpentine operator Alvin Rigell. Maybe the heartache and frustration of the last fifteen months finally got to Cooley. He had heard the whispers. Rivenbark was said to be one of the men who ambushed Alf, and Arch Cooley in September 1911, killing both of them. Alf, or Alfred was the oldest son of Hyman. Arch was his nephew. No one was arrested for the murders, even though the community in the north part of Santa Rosa County was sure they knew who did it. The Turpentine industry and the people who ran it was a powerful force in the area. Cooley felt it was his duty to get justice for his family. So, in the late afternoon of the 23rd of December 1913, Hyman Cooley armed himself, and made his way to the Rigell home to make things right. Franklin Gaye ran a turpentine operation between Munson, and McClellan Florida in a community known as Dogwood Grove. He employed many locals, and utilized about 30 prisoners housed in a nearby stockade. Three of the convict guards at the stockade were, Leon Rivenbark, William Wolfe, and Alfred Cooley. Rivenbark was married to William Wolfe’s sister. Jonah Cooley had timber available to lease to Mr. Gaye, and they struck a deal. Walter Rivenbark, Leon’s brother, was a “Wood’s rider” for Franklin Gaye. Upon inspecting the Cooley timber, it was found to be spiked. Nails had been driven into some of the trees. When a “chipper” strikes a nail, an axe-like instrument called a “hack” is broken. Apparently, the nails were driven by children as a prank. Cooley assured Gaye that he would have the nails removed, and may have even been contracted to do this. A few days later, it became evident to the turpentine men that either the nails had not been removed, or that more had been driven into the leased timber. This time Jonah Cooley was summoned to Gaye’s commissary and was beaten severely by Gaye, and Walter Rivenbark. Jonah’s brother Dan Cooley was involved in other business down near Pensacola. Upon hearing of the recent events, he sent word that he would be returning to straighten out the trouble. On Sunday morning the 27th, Franklin Gaye was standing near the doorway of his commissary when he saw Daniel Cooley riding toward him. He stated later that Cooley was carrying a shotgun across his legs, and made a movement to raise the weapon. Gaye reached inside the door and producing his own shotgun, shot Daniel from his saddle, killing him instantly. The Cooley’s were traveling in a buggy after picking up the month’s payroll in town. At the site of the ambush, Archie fell out of the buggy, Alf was found in the buggy about a half a mile away. Numerous shots were heard, and there is nothing noted about the fate of the payroll. There were no arrests made, and even though the locals felt they knew who had done the killing, there was no justice for the Cooley family. So, Hyman Cooley arrives at the home of Alvin Rigell at what is known as The Flower’s Stockade, and calls out to Leon Rivenbark to come outside. “I know you killed my son!” says Cooley as he produces his revolver and fires one shot at Rivenbark. The shot missed, and Rivenbark pulls his own weapon and shot one time hitting Cooley in the head, killing him on the spot. The Coroner’s Jury ruled that it was a “Justifiable Shooting”. By 1920, Leon Rivenbark was living in Rapides Parrish, in Louisiana, working as a Naval Stores Operator, still in the turpentine business. He lived there with various occupations until killed in an auto wreck in Alexandria, La in May of 1968. His body was brought back to Santa Rosa Co., and he was buried at Serenity Gardens. Walter Rivenbark had a much shorter life. After a bout of Typhoid fever, he passed away on September 13, 1913, and is buried in the Milton Cemetery. In September of 1908 while working as a woods rider for Franklin Gaye, He shot and killed a black man named Frank Markly, in the woods about 15 miles north of Milton. Reportedly there had been an altercation between the men, and Rivenbark left to arm himself. According to a woman who witnessed the events, when Rivenbark returned, Markly approached him with a turpentine hook, and Rivenbark shot him with both barrels of a shotgun. An inquest was held and it was determined to be Justifiable homicide. Franklin Gaye departed the county before 1920 also. In the 1920 census he is living in Sabine, Texas working as a garage manager. In 1930 he is listed as a Turpentine manager in Jefferson Co., Florida. His grave is in Trinity, Texas however where he was buried in 1934. William Wolfe, a convict guard, neighbor, and brother in law of Leon Rivenbark was not officially implicated as a participant in the feud. It should be noted that in 1931, he was the prime suspect and briefly detained in the ambush murder of Aubrey Gainer in Milton. Many members of the Cooley family including the members named in this story, are buried in the Sullivan cemetery, near Munson. It is a small cemetery, isolated and quiet, located in the woods. If there are descendants of any of the folks involved in the events described here, I would love to hear from them. I’m sure there are oral stories handed down that I would be very interested in recording.